When creating an armature for a figure, look at the relative sizes of the body parts of the figure you want to make. For example, if you're going to make a humanlike figure about 7 inch high, it should have 2" lower legs, 2" upper legs, about 1,5" for the body, and a bit more than an inch for the neck and head. These aren't exact measures, they are just to give you an idea of the relative proportions. 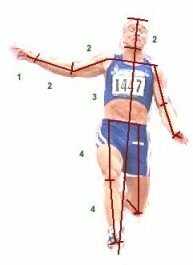 Feel free to experiment and create your own method for measuring. And, if you know the rules, you can break them! Comic book characters, for example, tend to break the rules a lot. If you look at the Calvin and Hobbes comics by Bill Watterson, you'll notice Calvin's legs are almost half a lenght shorter than normal proportions! On the left is an armature I made for Spaceman Spiff, Calvin's imaginary hero character. 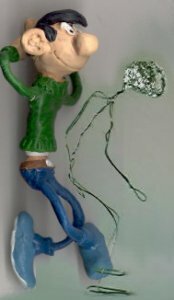 And on the right is an armature for Gaston Lagaffe, the creation of the Belgian artist André Franquin. His proportions are a bit off too, his arms and legs are too long, which gives a perfect long, tangly effect.